I’m Getting Organized: Hall Closet Makeover! One of my goals this year is to get more organized. I don’t have a lot of storage to work with – my apartment has two closets – so it’s important to maximize space in both. I’ve already done a bedroom closet makeover, so it was time to focus on the hall closet. This closet serves a lot of purposes. Most importantly, it’s my husband’s closet (our bedroom closet wasn’t big enough for both of us), however, it also houses all of my craft supplies, games, my makeup/nail polish, and a lot of miscellaneous household items. It’s really a catch-all space! I think you can see what I mean by catch-all! When we moved into our apartment, the closet was fairly well organized, but it had gotten a little out of hand. The main problems were all the loose items just floating around (nail polish, craft supplies, etc.) and a lot of frequently used items that were difficult to reach (like the first aid kit). I also had some extra items that I wanted to fit in the closet. To get started, I focused on items that need to be corralled: nail polish, batteries, and a first aid kit. I had been using an old Birchbox container for my nail polish, and it was overflowing. I’d like to get a more permanent solution at some point, but for now, I just used another Birchbox container (I seem to have a lot of those laying around). I also sorted my polishes by brand, which made them easier to fit in the boxes. Voila! Our battery “collection” was also overflowing. Have you ever purchased a something that you already have at home just because you can’t find it in your closet? Guilty! Let’s just say that we have a battery surplus. Batteries are difficult to store in their original packaging since it’s so irregular, so I purchased an inexpensive bead organizer with removeable dividers. It was the perfect thing to hold our batteries, and from now on, I’ll know exactly where to find one when I need it. The next project was getting my first aid kit under control. Previously, I had this kit stored in the back of a shelf, making it difficult to find what I needed and hard to put things away after using them. There were also some pills that didn’t fit in the current kit (an acrylic container). I removed the first aid kit and free-floating pills from the closet, and then started sorting through everything, removing anything that was expired. Next, I reorganized the kit, fitting everything back in the acrylic container. I stored the extra pills in a photo box. Much better! With those three problems areas solved, I worked on the rest of the closet. I moved my craft bins to the top left shelf, where they’re easier to get to. Then, I moved the towels, sheets, and paper products down to a lower shelf. I also moved our dirty towels (previously on the bottom left) to a hamper in the bedroom. This created room next to my sewing machine for a wooden crate, which holds patterns and fabric. It’s hard to tell from the before picture, but the closet has additional shelves above that long shelf on top. It’s not very convenient to access those shelves though, so I stored our air mattress and some other items we don’t use very often up there. I also straightened up the games, which left room to store my camera bags on the right side of the shelf. Our shoe shine kit lives up there, too. I didn’t do too much to the right side of the closet (other than straightening things up), since that’s Joel’s half, but I did hang our umbrellas on an existing over-the-door hook. They should be much easier to find now. Come back tomorrow … I’m going to share some of my favorite organizing tools and tips! What was your last organizing project? Do you have any good tips to share? P.S. See more of my hall/entry here. 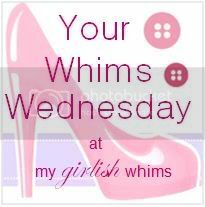 I’m linking up with The Wednesday Roundup, Make Bake Create, Your Whims Wednesday, Work It Wednesday, 52 Mantels’ Thursdays Are Your Days, Lamberts Lately’s Create It Thursday, Live Laugh Rowe’s Live Laugh Linky, Sweet Bella Roos’ Pin It Thursday, and Lovely Ladies Linky.